Today is day #8 of the 12 Days of Autumn celebration. 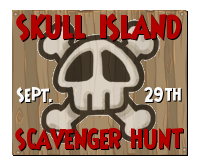 It is also the day of the celebration I have been looking forward to the most.....The Skull Island Scavenger Hunt! All around the world of Skull Island, there will be 8 pirates hidden in specific locations. When you find a pirate, they will give you a clue to the next location. The first clue, which will lead to the first location in the scavenger hunt, will be announced at the bottom of this page at 6:00pm Eastern (the start of the scavenger hunt). The first 3 people who reach the last location, and say the key words, will be awarded prizes as follows: 1st prize - Mount of choice & 3 Tribal Crew Packs, 2nd prize - Pet of choice & 3 Tribal Crew Packs, 3rd prize - 3 Tribal Crew Packs. Here are the rules for this contest. Please read them all before participating. The first seven locations will be in One Eyed Jack, area 1. The 8th will be in a mystery realm (see hints below). At each location, you will be given a clue that will tell you who to look for next, where they are hiding, and what to say when you get there. When you find one of the locations, you will not be given the next clue until you tell that person the key word or phrase given at the previous location. Please do not ask the people helping with this event for more hints. I am the only one who knows all the people helping out and all the locations. Please be patient. The people along the route will be busy giving out clues. Give them a few minutes to respond! Please be respectful to other people and have fun! The last clue will give you a hint to a location and a realm. You will have to switch to the correct realm to complete the scavenger hunt. All clues will be in text chat. I have already logged on and adjusted so that all words will be readable to text chat players. Sometimes the phrase you have to repeat is the clue to the next location. Every quest starts at the beginning. Find Autumn and tell her you are ready to begin your quest.